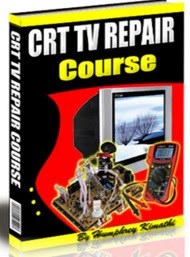 Hello Humphrey, I recently purchased the e-book CRT TV Repair Course and it definitely is a very solid read with loads of information, but I'm still having an issue with my TV which I'm wondering if you can help me out with. I have a Magnavox 20" CRT TV which seems to work fine, but the volume takes forever to be able to hear the sound. It takes about 3 to 5 minutes to slowly hear the TV. If the TV's only off a bit, the sound will resume just fine, but if the TV's off for a while, you have to wait all over again for the sound to once again resume. It's definitely a nuisance. What could be causing this, what could be done about this, and how much would it cost to get fixed. Again, it's a Magnavox 20" CRT TV with a model number of 20MT1331/17. First start with dry joints and if no change, let the TV run for some times without the cover, switch it off and remove the power cable from the outlet and touch the top of capacitors around the audio circuit. Whichever is getting hot should be replaced. I am assuming you don't have an ESR meter otherwise testing capacitors with ESR meter will be able to catch those capacitors easily. Hello my friend! I need your help! I have a CRT TV 21" that changes channels itself. I have checked the remote control but it is ok. Can you help me? Sorry for the delay, use the chart below to guide. Hi Humphrey regarding the email you received from Ernest Che may I say some technicians are in-human. Why am I saying this! Recently I have received a TV from customer for repair it had power supply problem. I opened the back cover to start diagnosing, disconnected all the cables from the set. Before I disconnected the socket which powers the IR and the standby led two of its wires were connected to the main power chord by certain technician who handled it previously. I disconnected the two wires from the ac chord and I powered the TV set but first I connected the series bulb trick I learned from your DVD power supply repair. Now I got 298volts at the main capacitor but there was no any secondary voltage. After thorough diagnosis I found one transistor A1015 having a short between two legs. Correct! Standing ovation for you Justus. I even thought it had killed the hot transistor but luckily it was spared. Now I removed one leg from of a resistor to the FBT and did a bit of soldering some dry joints and after checked the b+ voltage but now it had dropped to unstable voltage of 70v-77v. I turned the preset which is on the feedback path to the opt isolator but no change in the b+ .I salvaged another preset from another junk board and replaced and after taking the b+ voltage it was now 105v which gave me a smile. I connected the other leg of the resistor to the FBT but the set could not even switch. From here I had to take the voltage reading of the coil to the HOT driver transistor but I got absolutely 0 volts. I concluded somehow there was a shorted component along that line, checking the HOT it was ok, and checking driver of HOT transistor c2383 onboard my meter confirmed it was shorted. I removed it and measured it out of the board but it was found to be ok. Before I re-soldered the transistor still there was no voltage to this coil to HOT driver transistor. I now decided to take resistance check from the coil and cold ground and indeed the two lines had short. I decided to check the components before this coil I uprooted one electrolytic capacitor which filters this voltage to the driver transistor of the hot but after a certain resistor I found the two legs of this capacitor was twisted this was the cause of the short but It was done intentionally by uncouth technician. After replacing this capacitor and re-soldered the transistor I powered the set but it could not switch .Now I connected the two wires and the standby led came on. I checked the h vcc to this driver of HOT transistor but no voltage at all even from the processor i.c so I think the processor TDA 11105 ps is faulty. Thanks for your detailed report, but still I lost you at the end of your email. 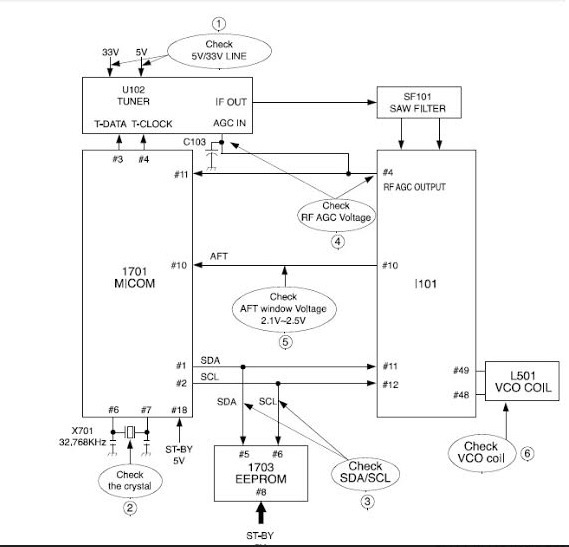 Equipment from other technician are usually an headache but what I usually do is getting the circuit diagram of that TV and this help me to pick which components are replaced with wrong ones. Voltage testing is the best in tracing fault component or track which may be broken due to careless handling. You talked of soldering one leg out of a resistor and voltage appeared... Which resistor is this, what is its purpose? Oh, that resistor act as a fuse, means is open. Most likely due to shorted component ahead. That's 100% possible but for my case I just isolated the 160v and did re-soldering of the components along the feedback path then later test the this b+ voltage when the fusible resistor Is not connected to link the primary pin of the FbT. Hello from India. I read your CRT TV troubleshooting blogs and I have learned many aspects about electronics troubleshooting from them. I am an electronics hobbyist. I have a LG Flatron CRT TV with chasis model CW62A which uses the HOT 2SC6090 and control IC STR X6556. It is now about 7 years old. It was on standby when it suddenly gave a tick-tick-tick sound. The sound was coming from the relay of course. I inferred that the switch mode power supply was trying to start but was unable to do so. The HOT transistor 2SC6090 was indeed shorted. When I replaced it with a new one, the tick-tick-tick sound was gone and the TV status indicator was red, which means that the TV was indeed on standby. When I switched on the TV using the remote control, the TV gave the tick-tick-tick sound again, and no picture appeared. What could be the problem?? Which section should I investigate? This is the first time I am troubleshooting a CRT TV. I am eagerly awaiting the results of your supreme insights. Thanking you in advance. Here 21 inch TV showing thick line across. Changed the caps from the 35v ones to the 250v +plus 160v for HT. No change .tested the deflection coil voltages =red + blue->blue is 110v; black+ white 11 each vs CRT gnd. It has a side chopper and additional focus screen controls attached to the CRT base with HV red wire. 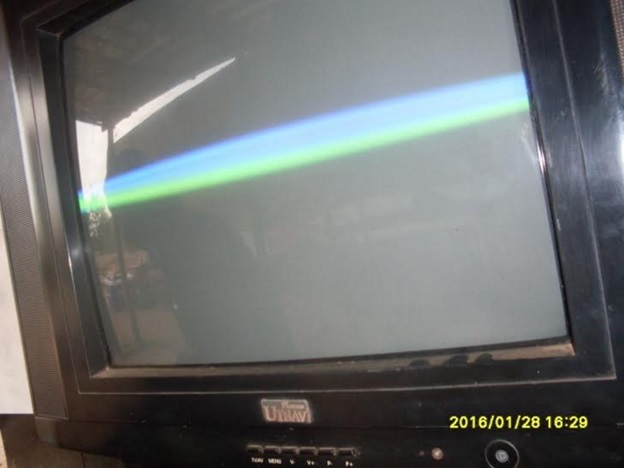 The tv with horizontal line, means which circuit is faulty According to your ebook? Thanks for your feedback Mr.Njoroge, Most ESR meter come with a chart of the optimum values of various capacitor values. if no chart then the rule of the thumb is that a good capacitor should have very low esr reading( less than 1 ohm)..any ESR value more than 5 ohm is suspicious unless if it has low capacitance and high voltage rating(eg capacitor 2.2uF/250V can have an esr of 7 ohms and still be good. Testing non electrolytic capacitor with esr? NO.